A lot of travelers who visit Istanbul also would like to pay a visit to Ephesus. Ephesus is located 450 miles south of Istanbul and it is 9 hours bus drive. Our recommendation would be to take a flight from Istanbul to Izmir and drive from Izmir Airport to Ephesus. Ephesus is 45 minutes drive from the airport of Izmir. 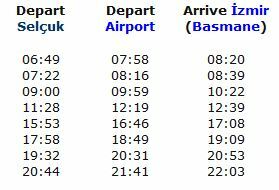 Last year a private airline called Atlas Jet started a free shuttle for their passengers from Izmir Airport to Selcuk Town. The other way of transportation is to take a bus from Istanbul. We do not recommend it altough the bus services are very high in world standards. It takes approximately 9 hours to drive from Istanbul to Ephesus. Railway system is not very much developed in Turkey. We would say the best way is to take a flight from Istanbul. If you would like to have a daily tour. We can arrange you a private tour starting from the airport. Airlines like AtlasJet and Onur Air have free shuttles fro flights from Istanbul. If you happen to come from a different destination or coming with a different airline. You need to drive or take a train. We provide private airport transfers to Kusadasi and Selcuk town from Izmir Airport. Selcuk is the modern name for Ephesus. It is a small twon having a population of 25 thousand. Selcuk is 55km south of Izmir. It is an hour drive from Izmir Airport. 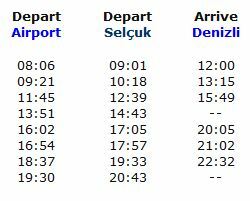 Selcuk is also accesible by train from Izmir Airport. The same train also go to Denizli where Pamukkale (Hierapolis) is located. There are sevaral options for visitors. Staying in Izmir is not recommended, since Izmir city does not offer much for the travellers. Village of Sirince can be a good choice but going there is a liitle bit difficult. Selcuk town is nice and very close to Ephesus but the hotels are not in high standards. Our recommendation is to stay in Kusadasi and do the tour of Ephesus out of Kusadasi. Kusadasi has several beaches, nice restaurants and good hotels that you may enjoy. the cruise ships calling to both of these ports. Izmir, is located at the western part of Turkey. It is the 3rd largest city of Turkey having population over 2.5 milion people. The largest export port of Turkey. Known as Smyrna in the ancient times. First settlement dates back to 3000 BC. Since the modern settlement was made on top of the old one there is not much to see in down town Izmir. Higlight of the area is Ephesus. Ephesus is located 65 miles south of Izmir, an hour drive.